Throughout much of history, at the heart of every village, town, and city in Europe, there lay a dead body. This was not the mystical body of Christ, symbolically consumed by his followers in the sacred rite of mass. It was a real body—a corpse; and whether intact, or only a fragment of bone, hair, or flesh, it was believed to be magical and alive. During feast days and other sacral events, this body had the power to draw the entire community together in a united and sanctified whole. Even more, it was only in the presence of this body, and through its miraculous agency, that one could supplicate God and be confident that he would listen. In times of crisis, in war, famine, plague, and drought, the promise of its protection was sought with the utmost fervor; sometimes this promise was all one had. It was the first, last, and best of hopes. How very odd such behavior seems, and yet how very common it was. All over the world families and communities have looked to the spirits of the dead for guidance and protection, and have desired to speak with them via their physical remains. The cult of the heroes in ancient Greece, and then the religion of household gods in classical Rome, served this function. With the end of paganism and the rise of Christianity, the impulse found new expression in the worship of saints and the veneration of their relics. The devotion to the dead bodies of holy persons began in the second century, grew rapidly at the end of the fourth century, and continued unabated until the Reformation in the sixteenth century. For more than a thousand years in Europe, all the important deeds of life were carried out under saints’ blessings, assured by the proximity of their relics. One did not plant crops, launch a ship, start a building, convene a gathering, give birth to a baby, or bury a relative without seeking to have the remains of saints physically nearby. As the special dead, saints were believed to be spiritual and invisible, but their power to heal, to bless, and to defend worked—or worked best—if they were materially and bodily present as relics. EVEN THOUGH THE worship of sacred remains was part of nearly every aspect of communal and private life, from politics to personal devotion, until recently relics received relatively little attention from historians and art historians. In the wake of the Enlightenment, relics were considered the most superstitious element in Christian cult, a primitive holdover of folk custom. In the modern era, many Protestant historians were disgusted, and Catholic historians embarrassed, by the tradition; both groups chose to look away and find other subjects for discussion. But in recent decades this neglect has been corrected, and relics have become a major topic of inquiry for scholars around the world. The surge of interest has reached a new peak in recent months. Although museums of European art have displayed relics and reliquaries ever since the early nineteenth century, almost never before have they featured exhibitions specifically about them. Yet this year there have been three shows: “Objects of Devotion and Desire,” a small but insightful exhibition on medieval relics and contemporary art, at the Bertha and Karl Leubsdorf Art Gallery at Hunter College; “Relics of the Past,” a collection of Greek Orthodox material from the Benaki Museum, on view in Geneva through the end of July; and most notably “Treasures of Heaven,” the first international show on relics, which after earlier venues at the Cleveland Museum of Art and the Walters Art Museum continues this summer at the British Museum. (I saw it at the Walters in Baltimore.) In addition, the distinguished medievalist Caroline Walker Bynum has just published a meditation on relics called Christian Materiality, and the popular writer Charles Freeman has released Holy Bones, Holy Dust, the first general history of relics in English. Freeman is an excellent narrator. He does not care for analysis and explication, but he loves to tell a good tale, and the history of relics overflows with countless bizarre and fascinating deeds. Comparing these stories, the reader can see both the slow changes in practice and the extraordinary persistence of a core of acts and beliefs that lasted from the end of antiquity until the Reformation. Holy Bones, Holy Dust is an enjoyable and informative book, although it is a little too light for its subject. The catalogue of “Treasures of Heaven” is exemplary in every way. The ten essays in the book, by an international team of scholars, are learned and accessible. The editors have done an excellent job of planning and directing these essays so that they cover the fundamental topics of the worship of relics in the Middle Ages. The clarity and intelligence of these studies, from the first piece on “The Religion of Relics in Late Antiquity and Byzantium” to the last on “The Afterlife of the Reliquary [in contemporary art],” makes this catalogue the best and most stimulating introduction to the subject in English. WHAT EXACTLY IS a relic? The word comes from the Latin reliquiae—literally, the things left behind—and the primary use of the term is for the body of a deceased holy person, whether intact or in part, no matter how small the fragment. The earliest recorded Christian relics are the bones and ashes of immolated martyrs, which were collected by the faithful in the second century. Starting in the late fourth century, Saint Ambrose and others began to dig up and venerate entire corpses. But it was rare for sacred corpses to remain intact, because any body valued enough to be worshipped generally was cut up and divided among many believers. Sometimes bits were given away as gifts; sometimes they were stolen. Such was the desire for the miracle-working bodies of saints that occasionally guards had to watch over mortally ill holy men and women to prevent the unauthorized dismemberment of their corpses as soon as they died. Body relics also included the blood of Jesus and the blood of saints, and the milk of the Virgin, which was especially treasured and worshipped. The cathedral at Chartres is just one of dozens of churches that house drops of her milk. Relics are an example of what James Frazer called “contagious magic.” Any thing that Jesus, Mary, or the saints touched was thought to retain the glow of sanctity, so items of their clothing, and objects from the life of Christ, particularly pieces of the True Cross, were also venerated as holy. Even the ground they walked on or were buried in was considered sacred and magical. Stones and dirt from the Holy Land were popular relics for pilgrims throughout the Middle Ages. 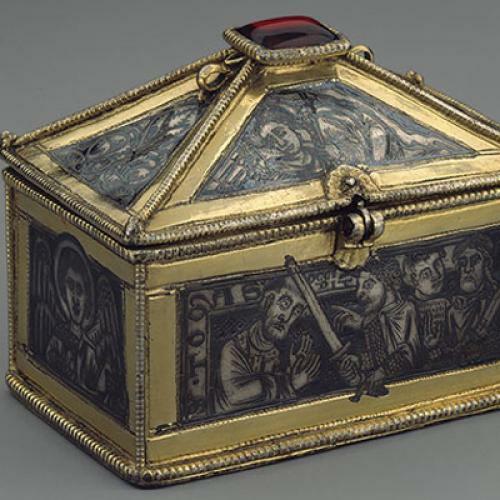 An example of this is included in Treasures of Heaven, a box with a lid depicting scenes from the life of Christ, and stones from the sites within; the box has been a treasure in the pope’s private chapel since the sixth century. In some periods so much earth was taken from the places of Christ’s Passion in Jerusalem that new soil had to be brought in every night to refill the ground. And the blessed power of these bodies, objects, and places was believed to be partly transferable. Cloth, bone, oil, or water that came into contact with sacred remains could be made into a new relic. Even the briefest account of medieval relics makes them seem alien and odd. What could be stranger than to pray at the foreskin of Christ or to bathe one’s tongue in the milk of the Virgin? Yet we must recall that it is a basic human impulse, observed in cultures throughout time and around the world, to treasure physical things that stimulate and enable remembrance. We naturally associate strong feelings with material tokens; we make, save, and share all kinds of objects with the hope that they will preserve memories and embody deep emotions. We do so, I think, because images and memories in the mind are simply too faint, mutable, and fleeting. To be made more real and to be shared, they must be objectified and concretized in physical things that we can actually see and touch. Talismans of memory help to evoke a missing presence, a being who is not physically there. They allow us to feel closer to absent loved ones or other figures of high regard, perhaps especially the dead. Relics were thought to overcome great spans of time and space, and even to connect different orders of creation. They linked the profane here and now with the great sacred beyond. To do this, they had to come from afar—literally. Virtually all relics throughout Christendom were transferred to their shrines from somewhere else. While a few, such as the remains of Saint Peter in the Vatican, were moved from a local grave site, most were brought great distances, and usually in stages, involving several owners and many centuries. Patron saints of important cities often came from remote and foreign lands: witness Saint Mark in Venice, whose body was stolen from Egypt by Venetian merchantmen in the ninth century. The arrival of new relics was viewed as a transfer of the saint’s allegiance, and a mark of God’s blessing. Cities competed for prestigious relics, and yet the remains helped them feel they were all part of a united Christendom. It is for this reason that the gift of relics from one community to another was an important part of the colonization of Europe by Christianity in late antiquity and the early Middle Ages. THE RITE CELEBRATING the arrival of new relics was fundamental for initiating their magic. This was called a translatio or an adventus, after the name of the ceremonial greeting of the ruler (or his symbolic surrogate, such as a portrait sculpture) in the Roman Empire. The ritual featured a procession of the relics from the gates of the city to the church where they were to be installed, followed by the consecration of their new altar or shrine. The parade was solemnified with incense, candles, and chanting, as one sees in the so-called Trier Ivory, a small and exquisite sixth-century Byzantine relief depicting an adventus, shown in “Treasures of Heaven.” All members of all classes and groups were supposed to participate, and to do so with the greatest sense of fellowship. The whole tribe is mobilized and all its authority set in motion to bear witness to the power and reality of the things revealed. ... Social cooperation is needed to surround the unveiling of things sacred and of supernatural beings with solemn grandeur. The community whole-heartedly engaged in performing the forms of the ritual creates the atmosphere of homogenous belief. In this collective action, those who at the moment least need the comfort of belief, the affirmation of truth, help along those who are in need of it. The evil, disintegrating forces of destiny are thus distributed by a system of mutual insurance in spiritual misfortune and stress. In bereavement, at the crisis of puberty, during impending danger and evil, at times when prosperity might be used well or badly—religion standardizes the right way of thinking and acting and society takes up the verdict and repeats it in unison.The act of unity and consensus sparked the power of the relic and made the promise of its protection available to each member of the community at the time of his or her own crisis. The adventus could be quite a spectacle. In 1220, the translation of Thomas Becket’s body within the cathedral of Canterbury from a temporary tomb in the crypt to a dazzling new shrine drew over thirty-three thousand observers, said to be the largest crowd up till then on English soil. In many sites the public procession of remains would be repeated to refresh the sense of their authority. Typically, this was done annually on the saint’s feast day, but it also could happen whenever the power or the independence of the community was challenged, as when the reliquary statue of Saint Foy of Conques was paraded around the borders of the territory in the twelfth century to ward off encroaching neighbors. Art historians have tended to think of tomb chests and other containers of relics as part of the history of the visual arts, and thus to analyze them as if they were conceived and designed chiefly to appeal to the sense of sight. But in practice the veneration of sacred remains engaged all the senses, and touching a relic or reliquary was the most desired form of encounter. Saint Gregory of Nyssa, at the end of the fourth century, described his congregation’s worship of relics: “For, as if it were the same body, still alive and flourishing, those beholding it embrace it with the eyes, the mouth, the ears. And when they have approached it with all the senses, they pour tears out over it from piety and emotion.” So strong was the wish for physical contact that, as in this account, looking at relics was regularly referred to as “embracing,” “kissing,” or “touching” them with the eyes. Indeed, when they could, worshippers would actually hug, touch, or kiss relics or their reliquaries. This act was like the embrace of a long-lost loved one—a desire for reunification in an unbreakable bond; but it also resembled the gesture of supplicants in Greek myth, who hugged the knees of the god, ruler, or victor to beg for favor or mercy. The kissing—and even the licking and the biting—of relics was a widely practiced custom in the Middle Ages, and one expressly condemned by John Calvin, Thomas Cranmer, and other reformers in the sixteenth century. MUCH OF THE history of art in medieval Europe can be seen as the history of efforts to channel the magical power of sacred remains. By the sixth century, it was customary for an altar to contain a relic, and under Charlemagne this practice was made legally obligatory. Like the Eucharist, relics were at the center of cult and rite, but remains were propitiated far more fervently for healing and protection. A great many churches in Europe were either founded or rebuilt specifically to enshrine relics, and to receive and awe the large crowds who came to seek their help. This is true of many civic basilicas, such as San Marco in Venice and Saint Denis in Paris, and of all pilgrimage churches, such as Canterbury Cathedral and Santiago de Compostela. A beautiful example of the blending of relic and painting is the Mosaic Icon of Saint Demetrios with Reliquary Flask, the one that likely belonged to Bessarion. At the center of this small but extraordinary object is a mosaic picture of the saint, made of tiny tesserae of gold, white, blue, and red glass. Attached to the frame above the picture is a lead pilgrim’s flask containing the holy oil from his grave. The frame is covered in gold and decorated with inscriptions declaring the miraculous power of Christ, Saint Demetrios, and the holy oil from his grave. The viewer is supposed to draw faith and blessing from both the image and the oil. Likewise the Imago Pietatis, or Man of Sorrows, from the Roman church of Santa Croce in Gerusalemme, combines image and relic in a radiant display. Imported from Mount Sinai, the icon of the dead Christ at the center of the tabernacle is surrounded by nearly two hundred tiny bones of different saints which seem to help extend and transmit the energy from the picture to the viewer. Some of these statues, such as Saint Foy, are complete figures, often sheathed entirely in gold and bedecked with jewels. But it was also common to make sculptures depicting just one element of the body—a foot, or more typically, a hand and arm. Works such as the Reliquary Arm of Saint Luke, on view in “Treasures of Heaven,” have an eerie and uncanny effect, as if the limb had suddenly and miraculously appeared right before your eyes. Life-size and astonishingly detailed in anatomy, the limb is unmistakably human-like, and yet it is made of the incorruptible materials of gold and rock crystal, as if it had been transformed into a higher and purer form of creation. An equally vivid and significant form of reliquary was the portrait bust of the saint. Given the vigor of Greco-Roman portrait sculpture, one might expect medieval busts to display an awareness of the earlier tradition; but in fact they were a wholly separate invention, and different in nearly every regard. The Reliquary Bust of Saint Baudime, from twelfth century France, greeted the visitors to “Treasures of Heaven” at the entrance of the show in Baltimore. Shrouded in gold and jewels, with arms raised, and wide, staring, shimmering eyes, the bust made the saint appear alert and yet alien, like a being from another realm. IN MODERN RELIGIOUS belief there is a tendency to think that the sacred is universal—God is everywhere—and to imagine that the holy is accessible through private devotion: prayer, meditation, reflection, and the like. But in the Middle Ages the common view was different. To be sure, magical forces, for good and for evil, were everywhere, but God was in heaven, and his blessing and protection could only be sought through the Virgin and the saints. While there was a strong tradition of mysticism, worship was largely a shared communal activity: religion was an affair for all, celebrated in public ceremony. Even mystics such as Meister Eckhart or Hildegard von Bingen pursued holiness (and achieved their fame) in the group settings of the monastery or the convent. Nothing illustrates the change of attitude in the Protestant north more than the case of Frederick the Wise, the Elector of Saxony, who as the ruler of Wittenberg became an early protector of Martin Luther. In 1517, when Luther nailed up his Ninety-Five Theses, Frederick personally owned more than seventeen thousand relics. But by the middle of the sixteenth century his entire collection had been thrown out or melted down, except one piece, the so-called Hedwig Beaker, and this was preserved not because of its associations with a legendary saint but because Frederick’s grandson had given it to Luther. It was saved as a memento—not as a relic—of the great reformer. In Catholic Spain and Italy, by contrast, the demand for relics and reliquaries continued well into the seventeenth century. Indeed, they were made on an unprecedented scale and with far greater theatricality than ever before. An outstanding example of this is the crossing of Saint Peter’s Basilica in Rome, which was redesigned by Bernini in the 1630s as a gigantic reliquary of the instruments of the Passion: the space spans nearly a hundred feet and has four colossal marble statues. Still, even in Italy, the link between image and relic changed. In the Middle Ages, the ideal representation had been a heaven-sent icon. In the Renaissance and the Baroque eras, paintings and sculptures were valued not only for their sacral function, but also as works of art, creations of human genius. The visual arts were judged by new aesthetic ideals that were largely irrelevant to veneration of the relic and icon. Painting and sculpture acquired a new cultural authority, independent of their religious purpose. The decline in prestige of relics continued in the eighteenth century. In 1765, in Diderot’s Encyclopédie, they were described as prime evidence of the superstition and irrationality of the Middle Ages. Scientists finally decreed that the dead body contained no residue of persona or vitality, but was instead a source of disease. Even in Catholic countries, the worship of relics greatly diminished. In Austria, Joseph II ordered the removal of many relics and images from churches, and in France during the Revolution rampaging mobs destroyed hundreds of altars, tombs, and statues. The churches of Italy still attracted pilgrims, but now many of these visitors came on the Grand Tour to seek inspiration from works of art, not from the saints whom the works depicted or the bones in the altars below the pictures. The Catholic Church reaffirmed the validity of holy relics, but except for a few shrines, they no longer drew reverent worship. ONE MAY WONDER why relics are now attracting so much attention, at least from museums and art historians. Oddly, part of the answer lies in the rise of modern and contemporary art, which has undermined the general validity of the Renaissance criteria of the arts. For the first time in five hundred years, the norms articulated in the sixteenth century, such as naturalism and classicism, are seen as historical, rather than universal, standards. Whatever one thinks of the effect of this change on art now, it does make it easier to understand the creations of the Middle Ages on their own terms: they are not incomplete or defective versions of what came before and after. It is noteworthy, too, that a number of medievalists have been among the most important experts on modernism, notably Meyer Schapiro, Hans Belting, and Christian Zervos, the author of the Picasso catalogue raisonné. Moreover, there are noteworthy correspondences between relics and the art of the last forty years. One is the fascination with the body, especially the body in pain. Although fundamentally different in purpose and context from the sacred art of the Middle Ages, works by performers such as Chris Burden, Marina Abramović, and others put one in mind of the relic’s emphasis on suffering and martyrdom. Indeed, these artists have looked directly to the physical trials of saints, including crucifixion and torture, as a model for their efforts. Also striking is the emphasis in many contemporary works on the power of objects to convey memory even in the face of death and loss. This is particularly clear in the work of Joseph Beuys, who even made modern-day reliquaries and crucifixes. Felix González-Torres also used seemingly commonplace elements whose meaning was intensely personal, rather than sacred and widely shared symbols, but like relics his pieces are meant to embody and give permanence to a missing loved one. From Walter Benjamin to Jean Baudrillard, many theorists have sought to understand the status of the image in the modern world by comparing it with the art of the Middle Ages. In our era images are ubiquitous, and largely secular in subject matter and frivolous in tone (with the conspicuous and sinister exception of political propaganda). Mass-produced by the culture industry, these images do not refer to an underlying reality; instead they are representations of representations, inherently fictional and illusory. But there was a time, a long time, when images were relatively rare, were handmade one by one, and were used primarily to show figures who were real or believed to be so. (Similar phenomena may be seen in tribal cultures around the world.) Images represented gods, rulers, heroes, ancestors, and moral exemplars—beings of exalted status, whose presence made special claims on the viewer’s attention and behavior. And these depictions were typically used in ritual and cult, thereby increasing their emanation of power. No one yearns to go back to an age of feudalism and superstition, but there persists a kind of longing for the authenticity that images formerly enjoyed. Benjamin famously stated that what “withers in the age of mechanical reproduction is the aura of the work of art,” and noted that this loss made “a medieval picture of the Madonna” seem all the more “authentic.” Baudrillard compared the pre-modern image, which was “the reflection of a profound reality,” with the contemporary image, which has “no relation to any reality whatsoever,” and wrote, “When the real is no longer what it was, nostalgia assumes its full meaning.” Thus a part of the appeal of the medieval relic may lie in its strong difference from the debased image of today. In recent years, Hans Belting, David Freedberg, and some other historians and critics have begun to show that the work done by images cannot be explained within the traditional boundaries of humanistic study, but instead requires more broadly based methods of inquiry, including anthropology and neuroscience. Freedberg’s The Power of Images: Studies in the History and Theory of Response (1989) and Belting’s Likeness and Presence: A History of the Image Before the Era of Art (1990) are two of the most innovative and influential books on the visual arts written in the last thirty years. The rise and fall of the holy image in Europe has been fundamental to inspiring this new line of inquiry. Freedberg began by studying iconoclasm in the Reformation, and Belting began by looking at the worship of relics and icons in the Middle Ages. For these writers, an image is not only an optical appearance; it is also, and most fundamentally, an embodiment of a presence—and so it is closely allied to the memorial function of the relic. It is perhaps no accident that the qualities we seek and praise in works of art, whatever the works depict, are also signs of life: vividness, freshness, animation, and so on. Imago in Latin even means a death-mask made in wax from a deceased relative and forever after preserved in the atrium of the house and carried in funeral processions. We are back to the cult of ancestors as familial gods. Living in a secularized world, and no longer worshipping ancestors or seeking the protection of the dead, we no longer imagine these items to have actual magical power. Yet such things still carry the aura of a person, a period, a place. The love of relics has survived the revolution of modernity: there are physical objects that still link us one to the other, across both time and space. Andrew Butterfield is president of Andrew Butterfield Fine Arts and the author, most recently, of Body and Soul: Masterpieces of Italian Renaissance and Baroque Sculpture (Edizioni Polistampa). This article originally ran in the August 18, 2011, issue of the magazine.